Amana NGD5100TQ Front Load Gas Dryer 5.9 cu. ft. The Amana NGD5100TQ is an extra large capacity gas dryer that comes with an number of basic features. It comes in a front-loading design with white exterior finish and clean lines. Like other gas dryers from Amana, this one is designed with modern styling and a left side-swing door. Among its remarkable features are the automatic dryness control, 5 cycles, 3 drying temperatures, and end-of-cycle signal. The unit features automatic dryness controls that help you save on power while drying your clothes safely. The feature works with moisture sensors that determine how much moisture is left in the load to determine how long the drying cycle should last. The unit shuts off automatically once no more moisture is detected in the load. Five dry cycles provide more options for customization so that you can safely dry your load. The three drying temperatures make drying easier and safer as well. The end of cycle signal beeps when the washing and drying cycle is done. The beep may be a bit too loud but this ensures that you get to the load when it's fresh and still soft from the dryer. The extra large capacity of this unit makes drying easier and faster. Shorten your laundry time by washing several days worth of laundry in one go. The unit comes with modern styling, which makes it look more attractive. 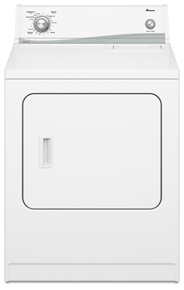 You can create a laundry room as chic as your wardrobe with this unit since it sports a clean and stylish design. The unit sports an attractive control panel with easy to use knobs and soft grip touch points. The white exterior is clean, simple, and goes well in any room. The front-loading also design adds to the sophisticated look of the unit. The large capacity of the dryer shortens laundry time considerably. The unit comes with a stylish design and large interior. It comes with excellent drying action, and the control knobs are very easy to use. The unit is compact, perfect for small spaces. This gas dryer comes with a customizable door panel, which can come in handy if you want the unit to blend better with other appliances or the decor in the room. The dryer tends to stop working at random intervals. The unit tends to make a lot of noise, usually a loud, scraping noise when drying larger loads. The end of cycle signal tends to be too loud and cannot be adjusted. The belt tends to wear down very quickly, which could account for the noise. The three drying settings may be too few for some users, especially for those who prefer more customized drying options. The touch points are a bit sensitive.